Since 1983, we have been serving the residents and businesses of Platte and Clay Counties, as well as the Kansas City metropolitan area with quality batteries at wholesale prices. Whether you need a new battery for your boat or one for your alarm system, we can save you money with our discounted pricing. Randy Best, and his father started this business in the basement of their home off of Hwy 9, back in 1983, reconditioning batteries to sell to car dealers in the Kansas City area. They also sold these batteries to the public for $14.95. In August of 1993, after the flood Best Batteries moved to Riverside, just across from the historic Red X. In 2006, Best Batteries moved to North Kansas City, and our growth has been amazing, however, prices have remained location pined affordable. Double click here to edit this text. CALL TODAY FOR OUR EVERYDAY LOW PRICING! 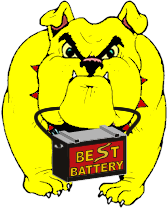 816-741-7816 \ u201CBest Batteries is a family-owned and operated store in the Northland. We have been serving the greater Kansas City area for more than 30 years, carrying many types of batteries. 0 We have Reconditioned, Blemished and New Batteries, whatever you need to meet your battery needs."